Get Your Renaissance Outfits Before the Season Ends! Renaissance faires are a popular Autumn activity around the globe. 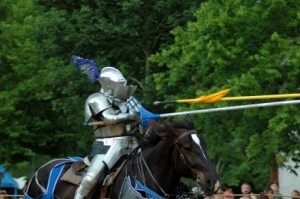 The allure of the Renaissance is appealing to many people, and it beckons visitors to participate in an interactive entertainment, including shows, jousting matches and performance art. In addition, Renaissance faires feature art work, food and artisan-crafted items that reflect upon a much simpler yet somehow more extravagant and romantic era. At many faires, you can get a discount simply for showing up in costume. Not only is dressing in Renaissance outfits a great way to save money, it is a fantastic opportunity to blend in and completely immerse yourself in your unique surroundings. Before your next trip to the Renaissance faire, head to Pearson’s Renaissance Shoppe to find a large selection of accessories and clothing items that are certain to put you in a festive state of mind. We offer many options for men, women and children, from princess dresses to pauper digs, so you can dress the whole family in one great online location. The faire season runs in many locations until the end of October, so there is still time to order Renaissance outfits for 2012. You will undoubtedly continue to enjoy your articles throughout the 2013 season, as well.